Reviewing speech recognition products has taught me about the uneven quality of PC headset microphones. I keep looking for something better. Recently I tried Plantronics' DSP-500 headset mike with a Universal Serial Bus connection. I wanted high audio quality in speakers as well as mike. USB is great for easy connection to PCs or notebook computers, but there's an even greater benefit in the Plantronics package: no need for a sound card. The USB-powered device, about three inches long, is integrated with the cord from the headset. Plugging in a USB headset for sound would be especially valuable for users whose systems have run out of expansion slots. 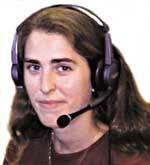 GCN's Amy Saperstone tests the DSP-500 headset, which plugs into a USB port. The hardware performance was nothing short of amazing. Audio sounded clear and distortion-free. The equalizer levels could be changed to match the application. For, say, a voice over IP app, you could optimize the speakers for voice frequencies. For a training application, you could open up the range so that music and other sounds come through fully. Compared with a standard analog connection, the digital USB headset was much clearer. The mike was one of the highest quality I have encountered. I tested it on a speech recognition package I'd reviewed earlier with an analog microphone. Using the USB headset, my percentage of words correctly recognized went up by 5 percent. That boosted my recognition rate from 89 percent to 94 percent, which translated into far fewer work stoppages during dictation. Unfortunately, the headset software was less impressive. On a notebook computer, which would seem to be the perfect use, the software installation procedure failed to offer an option to make the headset the default device. When I put an audio CD in the drive, it would play over the poorer-quality computer speakers instead of the headset. To fix this, I went into the device driver and removed other sound devices, but it only worked on about half the notebooks I tried. Another software problem was changing bass and treble levels. For some reason, the software occasionally stopped responding to commands. The software also had difficulty finding installed applications. For example, I installed an MP3 player directly from the Plantronics CD-ROM, but when I clicked on the MP3 button on the headset control panel, it would not open its own player, or any other player I had installed. A 5 percent boost in voice recognition might be reason enough to buy the Plantronics DSP-500 if you do much work with speech apps. But the software needs to have some holes plugged before the high-quality hardware can gain wider acceptance.